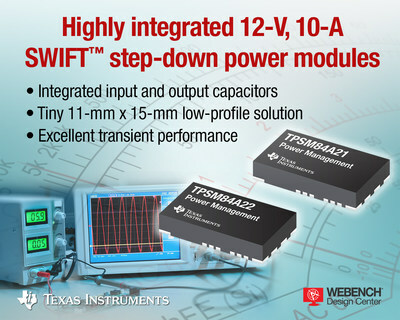 DALLAS, Feb. 13, 2017 /PRNewswire/ -- Texas Instruments (TI) (NASDAQ: TXN) today introduced a pair of 12-V, 10-A, 4-MHz step-down power modules that provide a power management solution that is 20 percent smaller than any other 10-A power module-based solution available today. The easy-to-use SWIFT TPSM84A21 and TPSM84A22 DC/DC modules integrate power MOSFETs, shielded inductors, input and output capacitors, and passives into a tiny, low profile footprint. In addition, it provides industry-leading performance, with as little as 1 percent overshoot in transient conditions without special magnetics or additional capacitors. For more information, samples and an evaluation module, see www.ti.com/tpsm84a21-pr. By using the step-down power module together with TI’s WEBENCH® Power Designer, engineers can get their space-constrained point-of-load (POL) telecom, networking, and test and measurement power-supply designs to market faster. TI will demonstrate the TPSM84A22 module in its booth (No. 701) at the Applied Power Electronics Conference (APEC), March 27-29 in Tampa, Florida. Download the application note, "How to Dynamically Adjust Power Module Output Voltage," to find out how to change voltage-regulator output on the fly for supply-voltage margining, output tracking, adaptive voltage scaling (AVS), optimizing load power consumption and supporting different system operating modes. Tiny solution:A9-mm by 15-mm module and a single external voltage-setting resistor make up a complete solution footprint of 11 mm by 15 mm. Low profile: Measuring 2.3 mm in height, the small size, weight and bill of materials enable placement of the complete solution on the back side of a printed circuit board. Easy to design: Integrated input and output capacitors eliminate the loop compensation and magnetics part selection from the design process. Use WEBENCH Power Designer to quickly create a complete 12-V, 10-A DC/DC step-down solution with just one voltage-setting resistor. Read the two-part Power House blog series, "Deciphering module datasheets," to learn what to look for in module datasheets to determine solution size and efficiency. Get more information on TI’s high-performance DC/DC power module portfolio. Search for solutions, get help and share knowledge in the TI E2E™ Community Power Modules forum. Download power reference designs from the TI Designs reference design library. WEBENCH Power Designer and Architect are the industry’s only online tools that enable end-to-end circuit design, simulation and optimization for footprint, price and efficiency, with the ability to download schematic and PCB layout files directly into computer-aided design (CAD) tools. Component libraries include more than 40,000 components from 120 manufacturers, and TI’s distribution partners update price and availability hourly. Offered in eight languages, users can compare complete system designs and make supply-chain decisions in minutes. Start a cost-free design now in TI’s WEBENCH Power Designer environment. WEBENCH is a registered trademark and SWIFT and TI E2E are trademarks of Texas Instruments. All other trademarks belong to their respective owners.